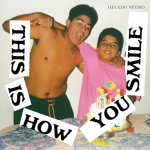 To listen to This Is How You Smile is to almost be taken back to your childhood. Though the arrangments feel intricate and detailed, the music itself retains a simplistic and innocent beauty and the pacing is languid and carefree. As a whole, it feels closer to coming across an old box of childhood photos and the bittersweet emotions that sometimes come from reliving the memories attached to them. Where his earlier work took a more experimental tone and was built around both samples and field music, his music has shifted gradually over time toward a more organic sound that arguably reaches new heights here. On Please Won't Please, an otherwise anxious beat is draped in glimmering synths and warm pianos. Steel drums appear towards the end of Imagining What To Do, as they add soft splashes of color to the gently plucked acoustics and breezy string section. Running begins with a gust of wind that gives way to a slow tumbling beat which carries a gorgeous melancholy piano refrain. Steel drums appear again on Sabana de luz, where the sound of a slightly out of tune guitar and strings carry it to a gorgeous end. This Is How You Smile feels like an exercise in restraint but not in a dull suffocating kind of way. What makes it work is how even as he continues embracing more conventional instruments and structures, Lange still leaves room for himself to tinker and experiment at the same time. For music so understated and gentle, it's almost startling just how powerful it's capable of being.